Whether you are looking for a flat web sling or a continuous fiber round sling, we offer the full range of types and sizes. When selecting the proper sling for your application, please allow our experienced staff to assist you in choosing the right type. It is vital for your efficiency, productivity and most of all your safety. 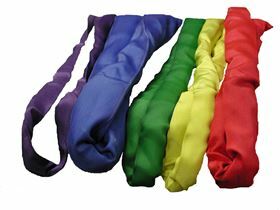 SYNTHETIC WEB SLINGS offer a number of advantages for rigging purposes. 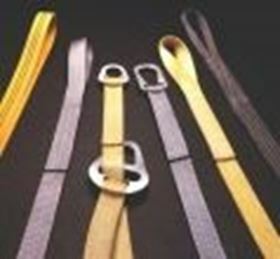 The most commonly used synthetic web slings are made of nylon or polyester. As is the case with all slings, identification is required for the life of the sling. Our experience in the field performing sling inspections has allowed us to evaluate many different types of web sling tags. We believe ours is the most durable tag available. Not to be used at temperatures in excess of 194 F.
SYNTHETIC ROUND SLINGS continue to grow in popularity throughout the industry. The varieties of configurations and rated capacities available have made them the sling of choice for many applications. Not to be used at temperatures above 194 F.
Please contact us for complete information regarding synthetic sling use and inspection. For inquiries and orders our experienced and friendly staff will be happy to hear from you. Copyright © 2019 Midwest's Complete Sling Manufacturer and Rigging Supplier - American Rigger's Supply, Inc.. All rights reserved.